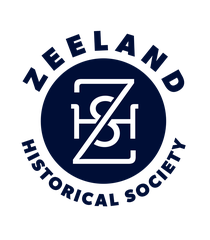 The Zeeland Historical Society is a nonprofit organization that proudly maintains the 1876 Dekker Huis/Zeeland Museum and the 1881 New Groningen Schoolhouse. Your generous support will help the ZHS continue to preserve our past for the future. Become a Member Members of the Zeeland Historical Society enjoy a wide variety of benefits. Learn more about becoming a member. Make a Donation With your contribution, the Zeeland Historical Society can continue to collect, preserve, and share the priceless evidence of our past for generations to come. Fund an Endowment Endowment funds will safeguard the long-term operation and maintenance of our two properties - the Dekker Huis/Zeeland Museum and the New Groningen Schoolhouse. Leave a Legacy Create a legacy gift to the Zeeland Historical Society by naming the Society in your will or as a beneficiary of a life insurance policy, IRA, trust, or brokerage account. Volunteer The Zeeland Historical Society offers a variety of volunteer positions at the Zeeland Museum and the New Groningen Schoolhouse.